Two years ago I purchased a sampler chart made in Denmark. 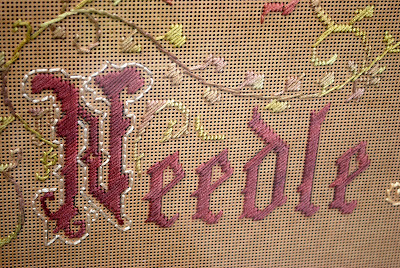 The original sampler stitched by Anna Thies in 1859, once hung in the Deutschen Stickmuster Celle, a museum in Germany. The museum closed this year. 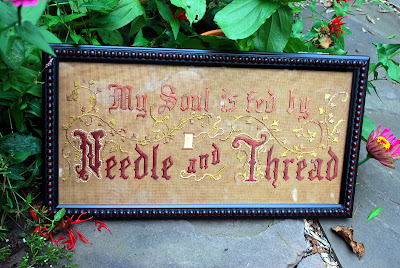 The DMC threads and linen were acquired at Hodge Podge in Historic Strasburg. I like the sampler’s fancy alphabet, the cat, the faded wreath of roses – representing the aged appearance of the sampler today - faded that is – all except for its tenacious Turkey red. Little by little I worked on it. Ideas occur to a stitcher. In the relaxing slowness she ponders. It occurred to me after stitching the first alphabet that I might replace the second with a verse from Proverbs that especially speaks me. How convenient it was that the thread count within the space accommodated the verse nicely. While I began to stitch this into the sampler I had my head in the biography, Invincible Louisa, written by Cornelia Meigs in the 1930s. Its pages contributed to my Mother Culture. Here’s why. 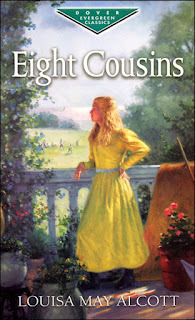 It is encouraging to get to know a woman such as Louisa May Alcott – a woman with “family love, loyalty and devotion. Upon such things the very structure of life is built.”*1 She worked with willing hands for the extent of her life. 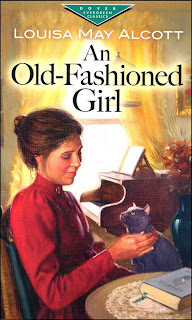 I liked reading the earliest parts of the book, Louisa’s infant years when her father, Bronson Alcott, was a contented teacher for a Quaker community in Pennsylvania. In a few years circumstances become strained. The Alcott’s experience pangs of poverty and dismay – but accompanied by courage and good humor – remarkably so. Bronson's experiment at Fruitlands in Massachusetts is his attempt to live out the utopian ideals of Transcendentalism. His wife Abba – the only woman of the little commune - has her hands full. She “who had toiled without ceasing for a moment since daylight, would be sitting by the single lamp, sewing as though her life depended on it.”*2 Abba prepares all the food, sweeps, washes, and keeps their family of six clothed quite primitively. Unlike Louisa’s novel Little Women, there is no mention of an “old Hannah” to help out. The tree-lined meadows of Fruitlands were a beautiful expansive playground for young Louisa - one of four sisters - but her memories of it were not always bright. At age 8, she admires her mother’s spirit and helps her in any way she can, for there were times when Abba is left to take care of the farm. By contrast to the Shaker Community across the river, which traded with the outside world, Fruitlands was meant to be self-supporting. Yet, it is doomed for other reasons, too. No animal could be forced into labor to plow or harvest. Nothing an animal produced could be used for food. The men of the commune are more philosophic than practical. In seven months the experiment ended. Invincible Louisa began to wear on me as any tale of struggle would. The countless household moves and the inability of Bronson Alcott to provide for his family aroused my sympathy. He has no talent for commerce. His teaching positions are fleeting. A profound thinker and excellent speaker he travels and lectures on transcendental philosophy. The pay is a pittance but Abba always welcomes him home with open arms. I am glad I kept turning the pages. Although difficulties arise in dwelling after dwelling where they live, there is never depression. “Something ridiculous was always to be seen in every adventure, something to call forth mirth and become the basis for a family joke.” *3 Doesn’t this sound like the stories she wrote? As a young woman Louisa sets out to somehow be a financial help to her family. She writes for magazines. She authors little fairy stories. This is something. But when finances become desperate she learns that her long hair is worth a startling and tempting amount of money. Does she ever cash in this reserved capital? After serving her country, nursing wounded civil war soldiers in Washington D.C., after utter exhaustion, recovering from a life-threatening illness, Louisa is urged to write a novel by a renowned publishing agent. 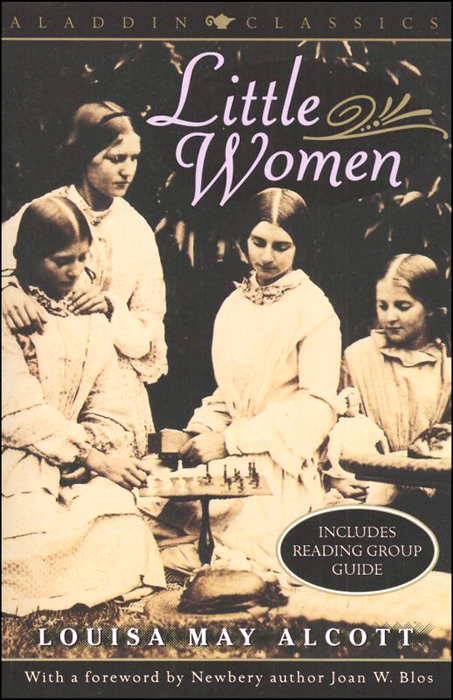 She sees the need for a story of quality, “instead of the sentimental and tragic tales which [young] minds were usually fed.”*4 Little Women is the result. It was an instant success, a book well loved by many. Cornelia Meigs softly relates that Louisa “was unlike Bronson, that although she was devoted to him, there were certain of his ideas which she did not truly comprehend, . 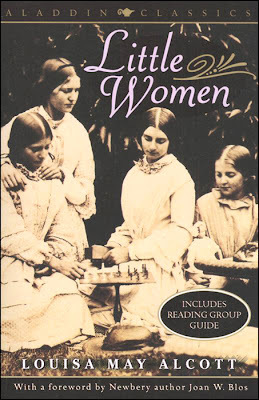 . . she did not quite fathom the motives behind them.”*5 In Little Women in which she writes about what she knows and loves best - her mother and sisters - she says little about the father of the story. She does, however, acknowledge Bronson while she describes the perfect school for poor boys that he always dreamed he could establish. 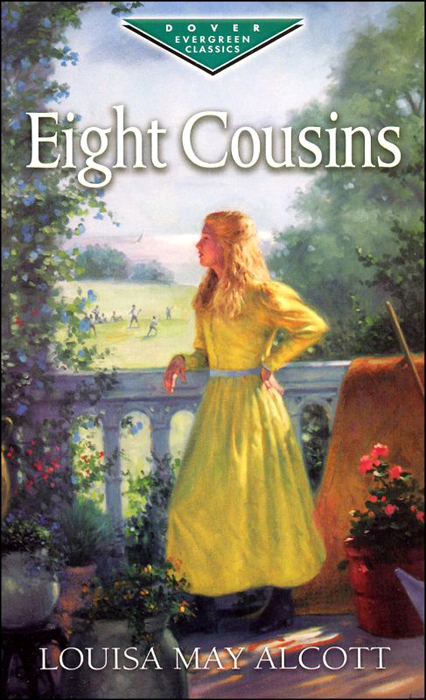 With the publication of Little Women, and her other novels, Jo’s Boys, Little Men, An Old Fashioned Girl, Eight Cousins, etc., that follow, life gives Louisa what she asked of it - finally - security for those whom she loved dearly – a happy ending. Fame and fortune are won by some but few win it with so much affection, affection that lasts for more than a century. Although Louisa May Alcott’s novels will appear as suggested reading for young readers, and this is fine, I think a more mature student would benefit by her greater sympathy. 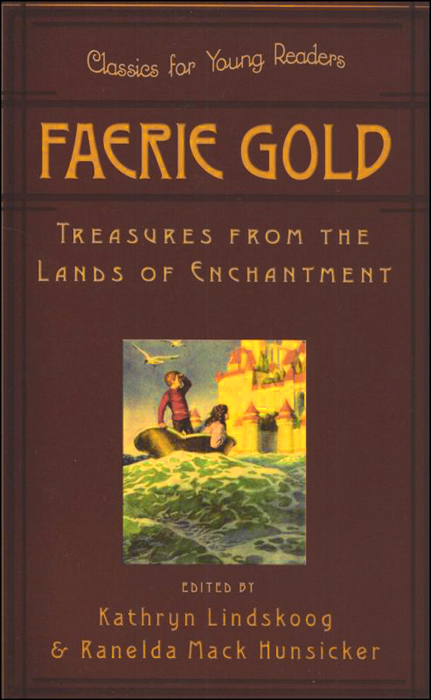 One of her fairy stories is among those in Faerie Gold. I haven’t read it but it interests me. In Your Story Hour Volume 2 a commemorative tale is told about her. The Your Story Hour recordings were heard over and over in our family. They will meet the expectations of those who seek inspiring content expertly told. After a novel or two, a high school student would appreciate Invincible Louisa. Above all, this biography as well as the novels, makes a welcome read for an adult. By them we who are walking through life’s pressing responsibilities, we who are faced with life’s increased challenges, will be reminded not to give up on our dreams. Cornelia Meigs, Invincible Louisa, Scholastic Inc.
Do you like historical houses? I do. 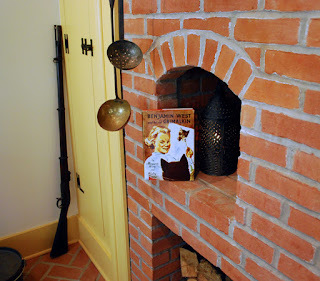 To see a tour of rooms click Orchard House. It is where Louisa wrote Little Women. Fruitlands is preserved and open as a museum today, too. My sampler photographed on the back of the sofa awaits framing. Can you see the verse from Proverbs? 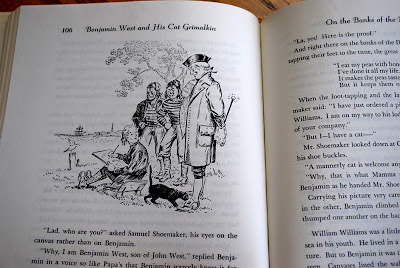 On the margin of this blog is a favorite quotation of mine by the early American artist Benjamin West (1738-1820). When I came across it my soul was warmed. 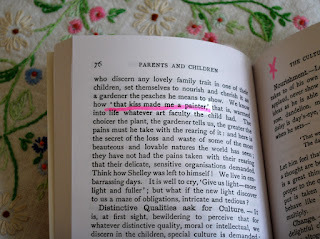 I guess that’s what it means to find an idea, “touching.” It was then that I decided to work this quote into my talk “The Gentle Art of Learning.” Later I placed it in the margin here. This spring I thoroughly enjoyed reading the children's book, Benjamin West and His Cat Grimalkin. One by one my children read it silently, during our home school years, which had left me out of the loop. With this said, I’ll share a coincidence. 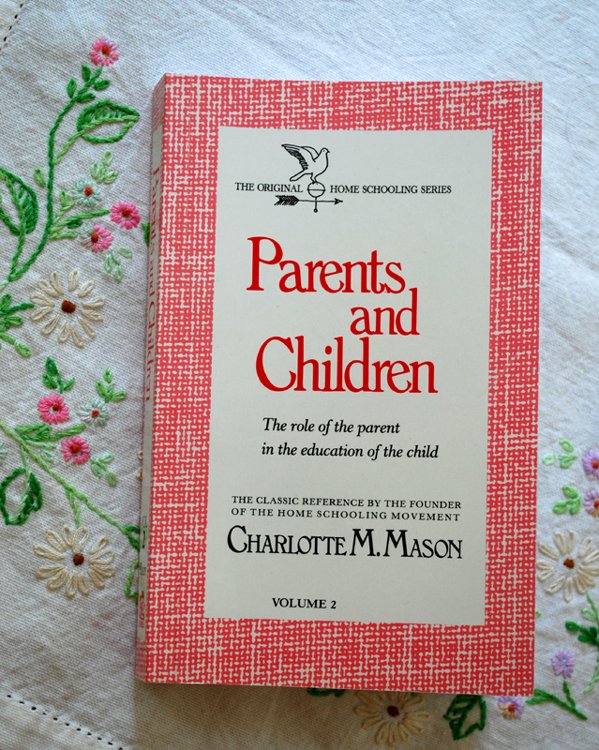 While recently reading some pages by Miss Charlotte Mason, lo and behold I met with a reference that popped off the page. Miss Mason references the above quote taking for granted that Benjamin West was common knowledge. (He served as president of the Royal Academy in London.) Anyway, in previous years the reference made no connection. “The duteous father and mother . . . who discern any lovely family trait, in one of their children, set themselves to nourish and cherish it as a gardener peaches he means to show. 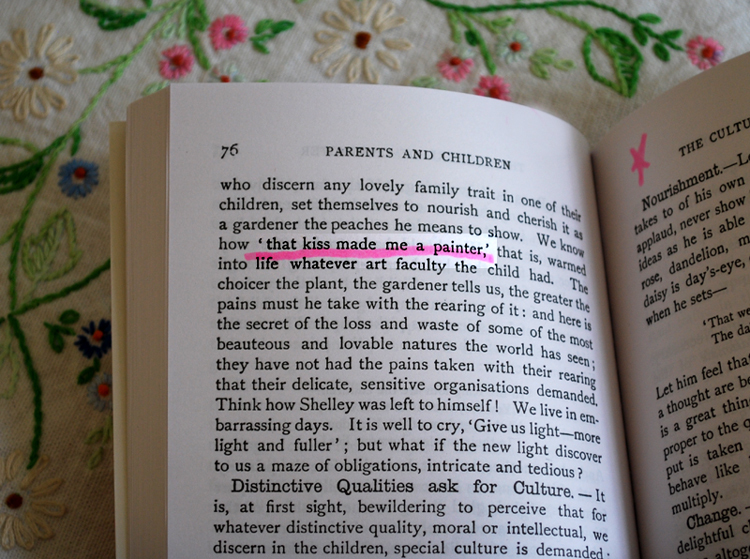 We know how, ‘that kiss made me a painter,’ that is, warmed into life whatever art faculty the child had. 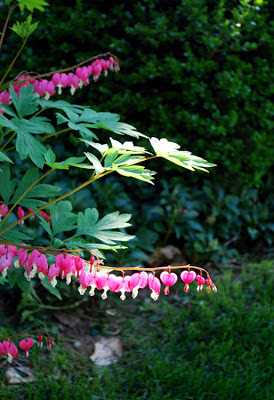 The choicer the plant, the gardener tells us, the greater the pains must he take with the rearing of it.” Parents and Children, page 76. What is your child’s interest? What does he “take to” readily? In what way can you nurture this interest? Miss Mason urges us to exercise an interest. The home school provides a wonderful freedom to do this. In the home school a child is not bogged down by a weighty back-pack of late afternoon homework and neither are we bogged down by seeing he does it. Even the time it takes to travel back and forth to school can be used to better advantage. I remember our bird watching from a back window while the children of the neighborhood waited for the school bus in view of a front window. It occurred to me then that before these neighborhood children crossed the threshold of the gigantic school, my children were already starting on their third lesson of the morning sitting around the kitchen table, on the comfy sofa, or at a desk. Much later, when the same neighborhood children got off the bus, my own children had already spent a couple hours with less formal activities such as drawing, origami, paper dolls, a back yard romp, roller skating, practicing their musical instrument, digging in the garden, listening to an audio story on a rainy day - girls voluntarily opening the pages of literature - in our son’s case a science magazine. In his junior high years our son took a fencing class that began before school was let out. The fencing instructor had so many home taught boys attending from miles around that he could schedule it thus. He had a special rapport with them. In earnest the boys threw themselves into their fencing practice. The same early afternoon hours well suited our daughter’s cello teacher (who was supposed to be retired) who taught most of his students after school hours. He told me that the home taught children were his best students. They were the most enjoyable to teach. (How can I resist relaying his compliment?) Could this be because the home taught child has a parent with the energy to be more consistently attentive at hearing a daily practice – also accomplished earlier in the afternoon? Could it be that these same children, who have no after-hours homework, could give their practice better focus? And could it also be that the home taught child shows respect and nice manners to their teacher with an alert sense of humor that reacts to the teacher’s ice breaker greeting? Based on our experience and my chats with other moms, I say yes. Family Traits cherished during childhood will often become those gifts and talents that are used in adulthood for recreation, ministry, or earning a living. Charlotte Mason wants us to make sure our students have some free time to play around with an interest and the power to pursue it. It may take some years before a Family Trait will emerge but we keep our eyes open for one along with opportunities for developing it. When I read the name under an oil portrait in the Brandywine Museum and saw it was Benjamin West it was a pleasant surprise. I stood and gazed at it with goose bumps. Knowing something about this early American artist made me feel a connection to history. 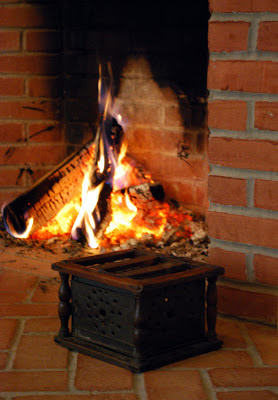 I was there in that big low-ceilinged kitchen at Door Latch Inn in the 18th century, where travelers could lift the latch at night, help themselves to food set out for them, warm themselves by the fire and set off again. 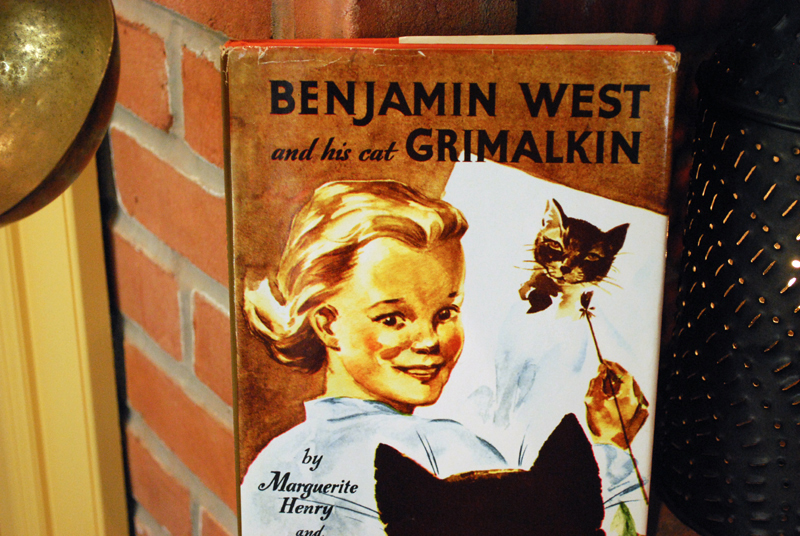 I was there in my imagination, in the wilds of Chester County, Pennsylvania, that is, while reading the children’s story, Benjamin Westand his cat Grimalkin. Margaret Henry has the writing ability to take her reader’s there. Most often travelers would join the West family at the long table set for thirty people sometimes. Their evening meals were lit by firelight and cooked by Mrs. West on the wide open hearth with the food from the West’s own farm. Benjamin is the youngest of the ten West children. Never having seen a picture – because in a Quaker household pictures were “unnecessary,” the idea somehow popped into Benjamin’s head to draw one. 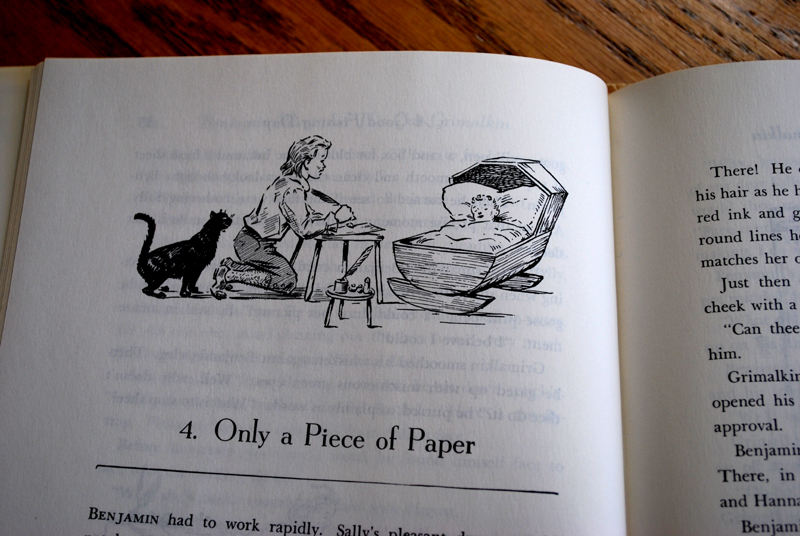 His baby niece Sally was sleeping in her cradle and Benjamin was stuck indoors bored on a beautiful day, baby-sitting. He picked up his father’s pen and made his first picture - a sketch of Sally. Subsequently, his urge to draw was strong. He soon began to draw “on anything that would hold a pen stroke or a smudge of charcoal.” He would draw when all his many chores were done. Yet, if he had any little time leftover his father seemed to come up with yet another chore for Benjamin, and drawing was put off. You see, in the West family everyone had a part to play in the workings of the farm and Inn. Among these modest Quakers, family love, tenderness, togetherness and hard work seemed all rolled up in one daily act of worship. There is suspense and humor in the story. 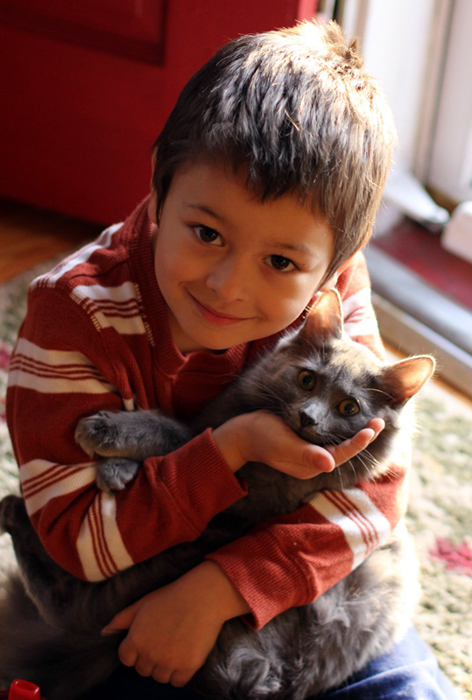 Benjamin’s cat Grimalkin is not a barn cat. It keeps him company everywhere he goes. When Benjamin learns from neighboring Indians how to add color to his pictures with clay from the earth, his mother also gives him some of her wool dyes, such as Indigo. But what would Papa say? “While Papa was a man of few words, each one counted.” It was only a matter of time before Papa found out why Grimalkin had so many tuffs of hair missing. No, Grimalkin wasn’t ill. To apply color to his pictures Benjamin had been using the hair on his cat’s tail to make “hair pencils.” When a hair pencil wore out, he’d make another and another. Papa said, “No more” when he found out about the use of Grimalkin’s hair. But out of character with the usual Quaker inclinations, Papa did allow Benjamin to continue making pictures when he saw his son’s talent. What joy, and what joy when a box arrives from Benjamin’s uncle with art supplies from Philadelphia and a real paintbrush. There’s nothing quite like enthusiasm and the door of opportunity. 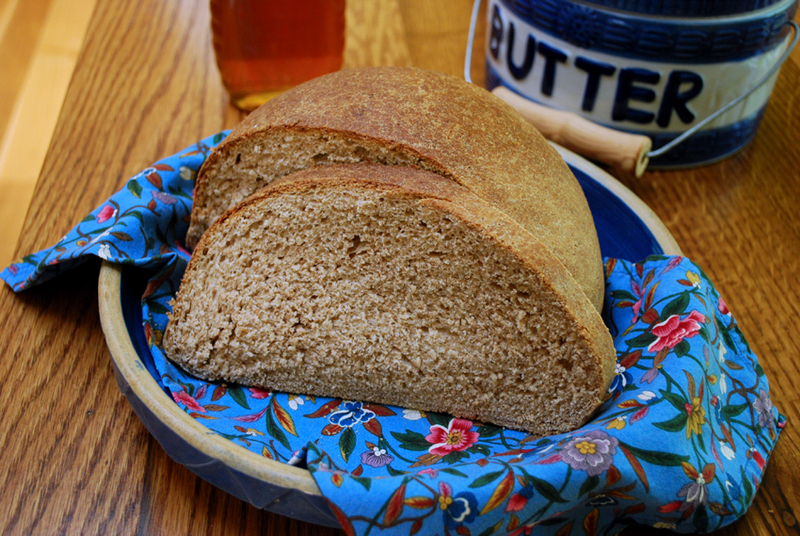 Enthusiasm is one of the qualities that make this story as bright as a blue sky over a Pennsylvania pumpkin patch, as flavorful as the scrapple from Mom’s skillet. The illustrations by Wesley Dennis show lively action and lively expressions. The plot carries the reader along. It reveals how God blessed Benjamin West with talent. His talent shows itself through the focused effort and practice that match his desire. This is a principle that we can each apply to our lives. Many of the sentences are short. 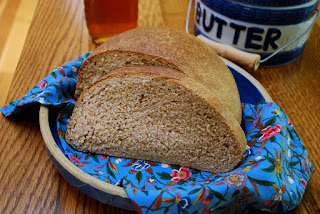 And although the story has Quaker “thees and thous” it would make a good chapter book for a second, third or fourth grade reader or an interesting read-aloud for a range of ages to enjoy at once. I wrote this in-depth review for a parent’s knowledge. It would be a bit of a “spoiler” for the child. Talking to my adult children recently I discovered that each of them fondly remembers reading Benjamin West and his cat Grimalkin – and that was long before we had moved to Pennsylvania. Disappointing news for me is that I will not be attending the Meet & Greet at CHAP as announced. I’ll miss seeing you. My pain level is up and as the conference hall is hard on the legs and back I had to face facts yesterday afternoon. Since the beginning of the blog I’ve had no reason to mention my chronic pain, until now. Thank you for your understanding. Dean, the Man-of-the-House, will attend the Rainbow tables Saturday morning. He is taking my place but he says he doesn’t look as nice in a Laura Ashley dress (he, he). Regardless of this please stop by and say “Hello” if you are walking that way or if you plan to rummage Rainbows tables. With Rainbow a little rummaging reaps bountiful rewards for book lovers. My unapologetic plug is that Rainbow’s generous selection of curriculum accommodates a variety of learning styles at excellent prices. I will be at home. 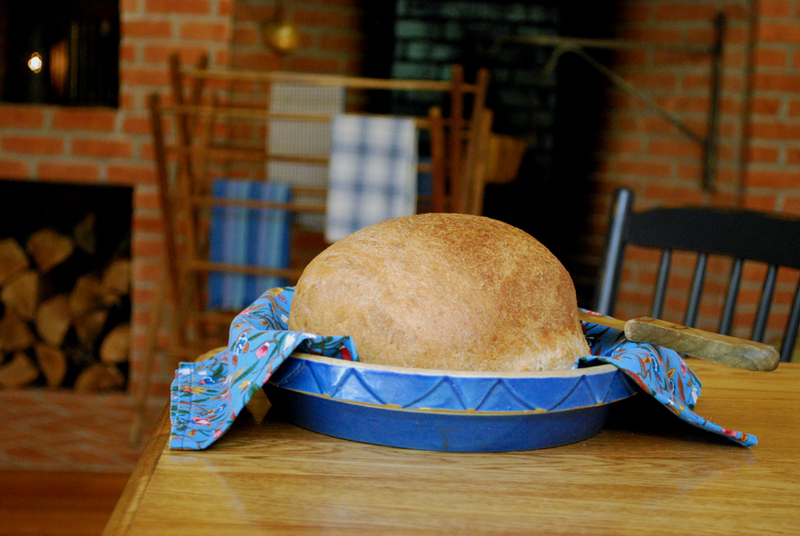 I’ll be making more progress on my next post to you, starting a rough draft on the next book review and baking a round loaf of whole wheat for the Man-of-the-House. 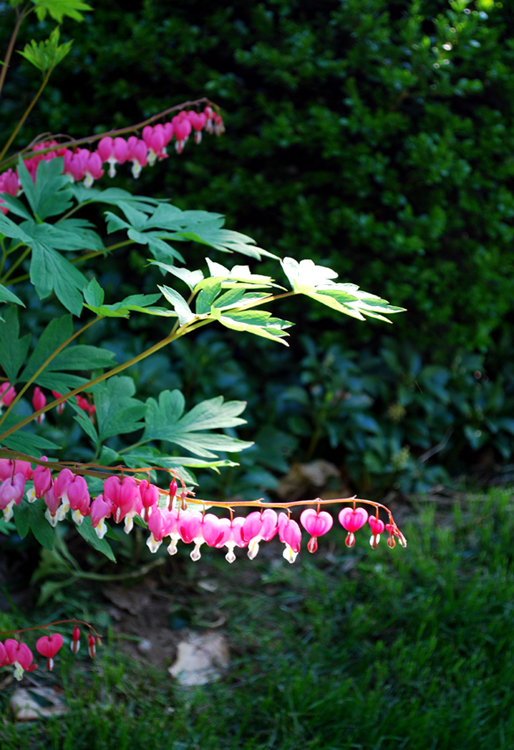 Later I'll gaze at the bleeding hearts at the back door where I will be waiting for his return. 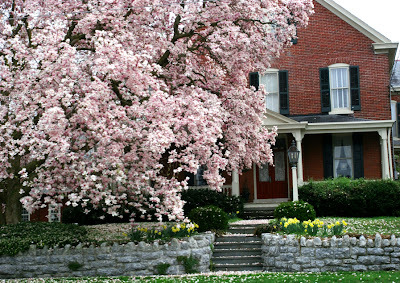 The Man-of-the-House photographed an ancient Magnolia in town. I wonder how long ago it was planted. 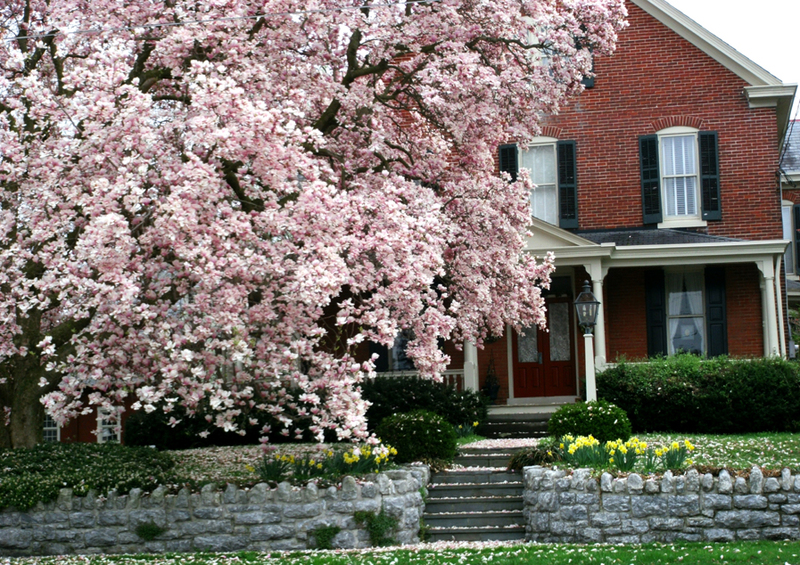 In spring the flowering trees in Lancaster are every shade of pink. Red bud, dogwood, cherry and crabapple bring refreshing beauty to the beholder. 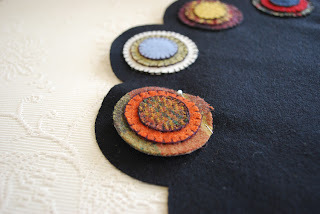 Next to flower gazing, I find that there are few more pleasurable pastimes than that of hand stitching. A friend shared with me the craft of punched paper mottos. In turn I shared the craft with my sister-in-law. She was intrigued. My sister-in-law has a home business. Answering the telephone when it rings intermittently throughout the day, sometimes from 8 in the morning until 8 at night, can be particularly taxing. But it pays the bills and her son’s college tuition. 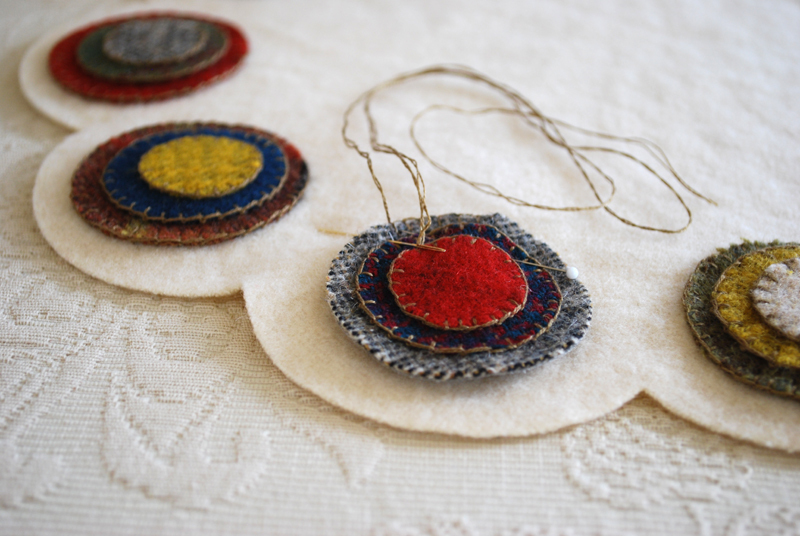 She has precious little time for stitching – especially if the pastime translates to overtime in an already full day. That’s why I was startled during a rare visit to her house (out-of-state) when I was presented with a framed motto. My further surprise was seeing it stitched in a phrase she evidently remembered hearing me say. How sneaky she is, as well as artistic. She smiled a big smile. “I keep the sewing bag here, beside the sofa. When my paperwork is up to date and there’s a lull in calls, I’ll come in here and pick up my needle.” At the word “needle” came the ring of the telephone. I watched my sister-in-law head for her roll-top desk on the other side of the French doors. 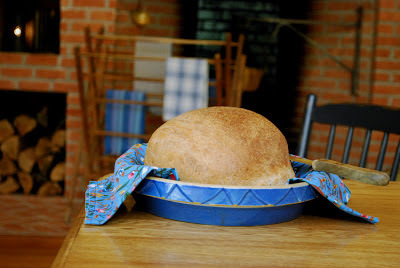 As I rose to go, too, for my visit was short, I recognized the hum of the clothes dryer and the fragrance of something simmering in the crock-pot that had eventually wafted its way into the living room. And so it was for the homemakers of yesteryear too, whose families were large and household chores were various and voluminous. A sewing basket set in arm’s length to a rocking chair could symbolize a break in the day, a moment of repose, and a treat in color and threads. 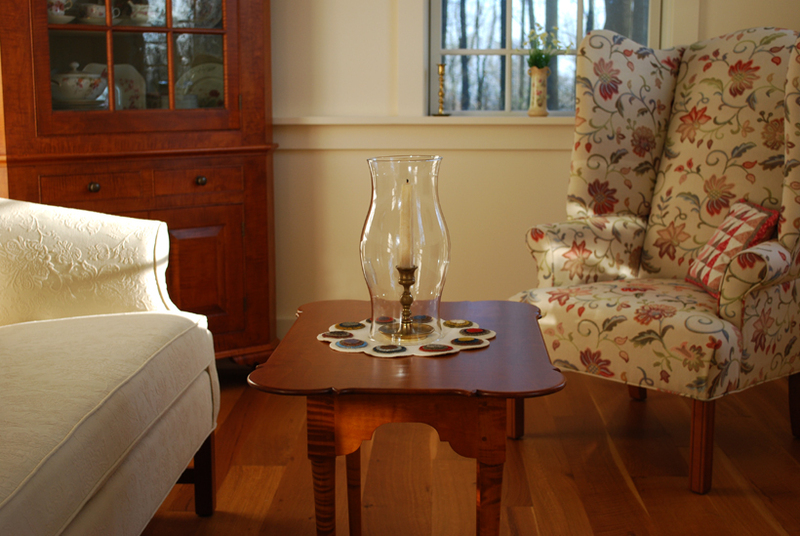 One early American home-sewn textile was the penny rug. These rugs were used as tablemats. 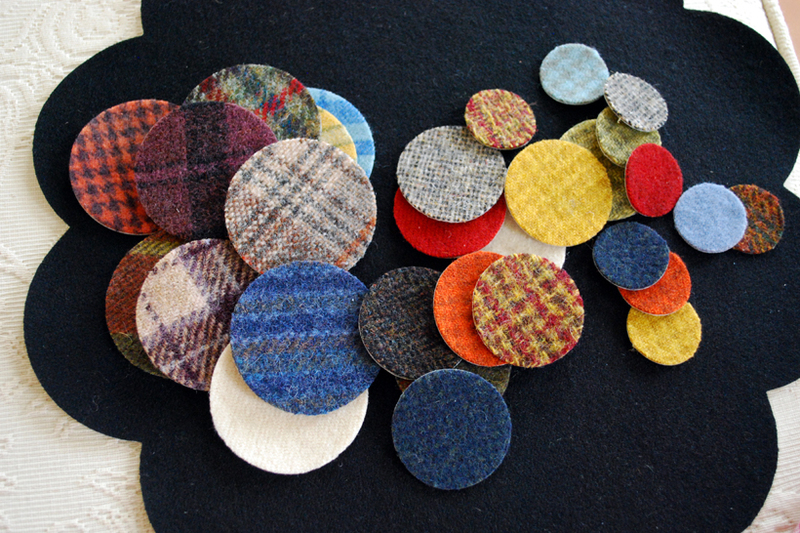 Frugal homemakers may have recycled pieces of felted wool for their “pennies.” For tracing the circles a large coin such as a silver dollar, as well as smaller coinage could have been borrowed from the housekeeper’s strongbox. A present-day revival of penny rugs means homemakers crave domestic arts as did their predecessors in the 19th century. Many who once said they hadn’t time for such things learned how the make time with pennies. To cut a penny out of wool takes minutes. 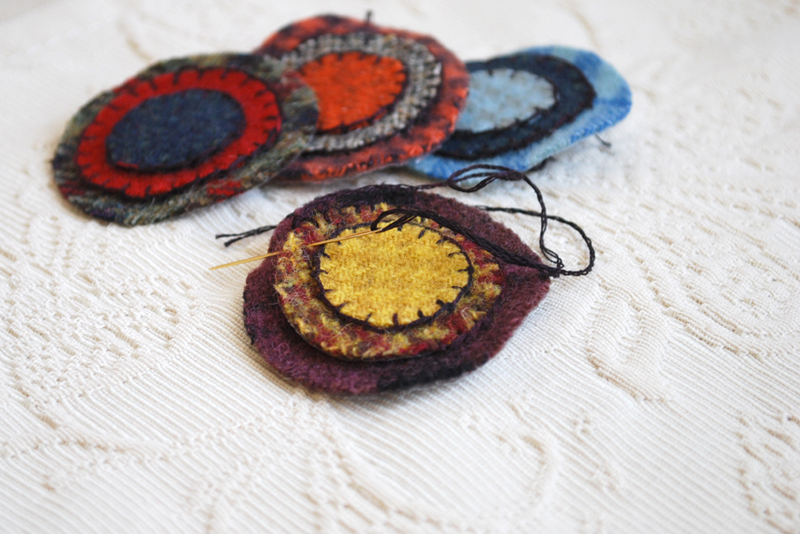 To blanket stitch one circle to another may be all I may accomplish in one sitting but most of the time I complete at least one penny. For my first try at this craft I confess that I bought a kit - two kits, actually. 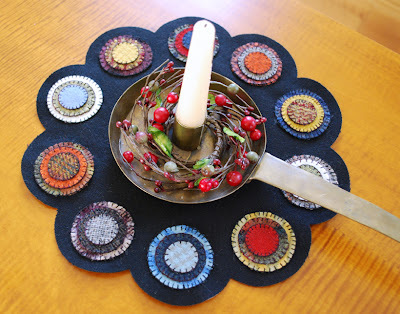 I think the candle mats are as cute as pie. They are of similar shape, aren’t they? Dare I admit to a short cut - that the pennies, as well as the scalloped mat, were pre-cut? I overcame disappointed that some of the wool in the kit did not appear to be felted. Yet it was a pleasure to sit on the sofa to arrange and rearrange the solid colors and plaids, forming pennies pleasing to the eye. I am finishing one mat in traditional black. Nothing less than direct sunlight through a window will enable me to see the black-on-black stitching. An easy chair by a southwest window is my chosen spot but a garden spot would be even better. The candle mat in vanilla matches the vanilla sofa. 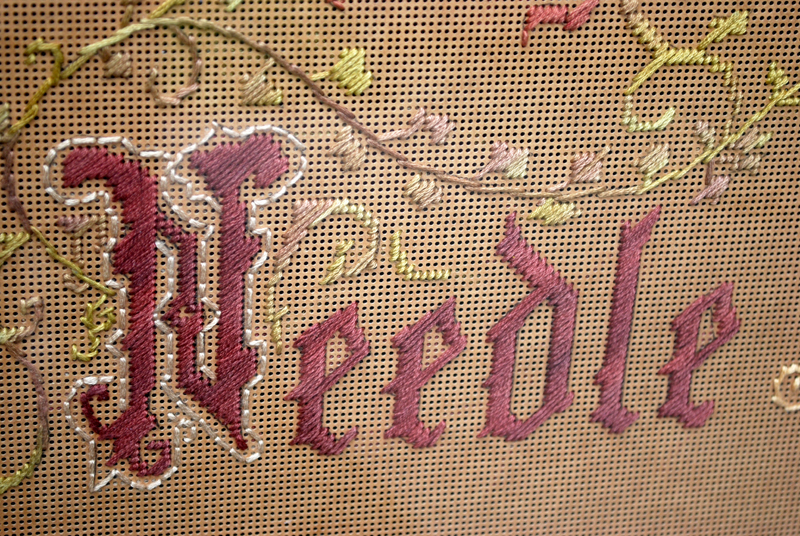 It is being blanket-stitched with a muted brown (2 strands of DMC 610) with a size 26 embroidery needle. It was with impatience that I took out the camera to show you my almost finished handiwork. The mats pictured await backing and blanket-stitching along the edges. This makes a slightly thicker “rug”. Wool remnants suitable for penny rugs can be found on eBay. My kits came from The Woolen Needle. An array of contemporary wool appliqué patterns is available today, too. Punched paper mottos can also be found with an online search. Dean and I plan to attend the CHAP homeschool convention Saturday, May 11th. Rainbow Resource is hosting a “Meet and Greet with Karen Andreola” from 9-11:30am. I am honored that this was their idea. I invite you to stop by the Rainbow table as I am looking forward to meeting you in person. I like to chat. 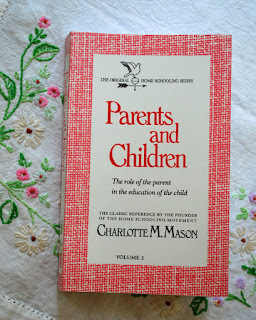 And I am happy to answer questions or sign old copies of A Charlotte Mason Companion. Rainbow has an impressive selection of “living books” for you to browse by subject. If I know Dean he will be restless. He will scout around the hall looking for interesting newly published books. Feel free to keep in touch, otherwise, through my personal email.